Blu-ray Disc – The high definition Blu-ray Disc™ format provides pristine video and audio quality for your home entertainment. BonusVIEW – BD “Profile 1.1” enables “picture-in-picture” and secondary audio features for viewing director or actor commentary while the main movie is playing. BD-Live™ – The BDP-83 support BD “Profile 2.0” and contains all necessary hardware – audio/video decoder, Ethernet port, and 1GB of internal storage – for BD-Live. DVD Up-Conversion – The BDP-83 uses the same VRS™ by Anchor Bay (DVDO) de-interlacing and scaling technology as in our award-winning DV-983H DVD player. The up-converted picture quality bridges the visual gap from your current DVD library to Blu-ray discs. DVD-Audio – The BDP-83 plays DVD-Audio and supports both stereo and multi-channel high resolution audio programs. Users can select whether to play the DVD-Audio or the DVD-Video portion of the disc. SACD – The BDP-83 plays Super Audio CD (SACD) and supports both stereo and multi-channel high resolution audio programs. Users can select whether to output the DSD (Direct Stream Digital) signal in its native format or convert it into PCM. Additional Media Formats – Additional disc and file formats, such as audio CD, HDCD, Kodak Picture CD, AVCHD, MKV, and other audio/video/picture files on recorded discs or USB drives can be played back on the BDP-83. 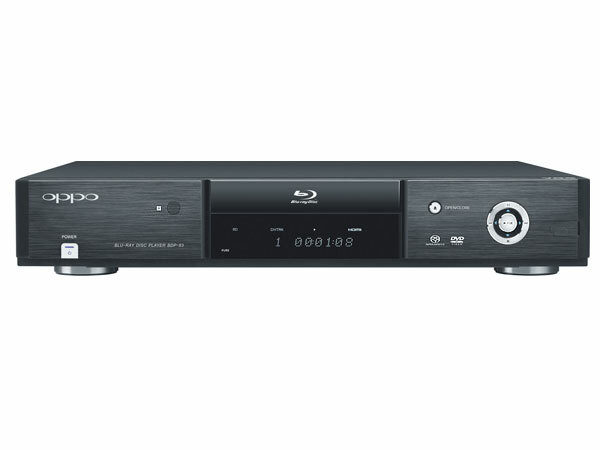 Ever since standalone Blu-ray players hit the market, there’s been a great deal of anticipation for an Oppo Blu-ray player, mainly because of the company’s reputation for making excellent upconverting DVD players. Oppo held out for quite some time, and in retrospect it was a smart move; almost all the early Blu-ray players were plagued with usability problems and hardware limitations. After a long beta-testing period, the Oppo BDP-83 is finally here and it lives up to the hype. The player feels fast and reliable, and has outstanding image quality on Blu-rays and DVDs. It’s a true universal disc player, handling both DVD-Audio and SACD discs in addition to Blu-ray Discs, CDs, and DVDs. The mission of this blog is to provide consumers looking to take the dive into the Blu-ray experience with information on quality and “affordable” Blu-ray players. With that being said I think I am doing anyone in the market for a Blu-ray player an injustice by not informing them on the OPPO BDP-83 Blu-ray Disc Player. From the moment you open the box you will see how Oppo is committed to quality (see the video below). Now I know it may not be “affordable” for everyone but this thing is like the Cadillac of Blu-ray players. In 2006, Internet-direct merchant Oppo Digital caught a lot of attention by serving up super high-performance video and audio playback with its DV-970HD up-converting DVD player. Since then, Oppo has taken its success and poured it into improving and refining its products, year after year. Now, Oppo takes its brand of excellence and brings it into the Blu-ray disc age with the BDP-83 Blu-ray player. A true universal disc player, it will play SACD, DVD-Audio, HDCD (as well as just about anything else you can throw at it) – and will do it faster and better than most rivals. Though the Oppo BDP-83 Blu-ray disc player is missing a couple of today’s popular streaming media features and costs a bit more than its competition from LG, Samsung and the like, fear not. The device delivers where it counts and can hang with some of the most expensive high-end players available.